With ADManager Plus you can modify multiple attributes of user accounts, including General Attributes, Account Attributes, Organization Attributes, Exchange Attributes, Terminal Services Attributes, etc. in just one-step. Further, you can also auto-fill specific attributes, based on the other attributes that are being modified during the modification process. Trying to do the same with the native AD tools or PowerShell can get quite tricky and cumbersome. Through this web-based Active Directory management tool's Reactive User Modification Templates with Modification Rules, the process of modifying user accounts, be it an individual user account or or bulk user modification, becomes amazingly quick and simple yet accurate and secure. 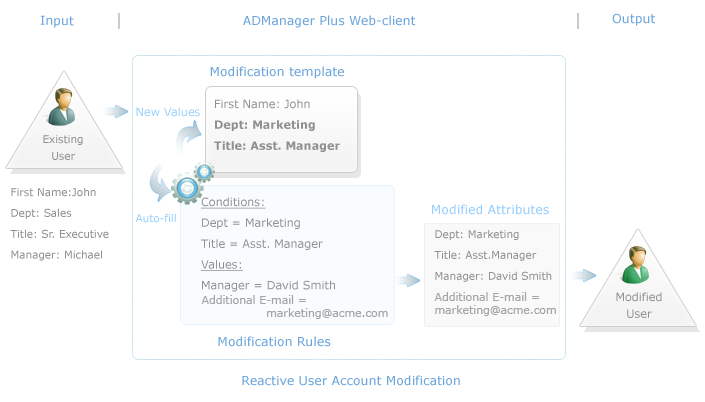 ADManager Plus' User Modification Templates empower administrators to standardize the process of modifying user accounts, across their organizations. Through these templates, administrators can save and reuse the values of the attributes with standard or common values, instead of modifying them manually for each user account. Also, as and when needed, administrators can even customize these templates to meet the specific demands of their organizations. In other words, user modification templates are molds that administrators can use for modifying their AD user accounts in a uniform, easy way. Automatically update specific user attributes whenever a user account is modified. Automatically modify certain user attributes based on the changes being made to other attributes. Automatically update this employee's 'Manager' attribute as per the new values in the 'Department' and 'Title' attributes. Auto-fill the 'proxy' or 'additional email addresses' attribute with that of a marketing team email address like 'marketing@acme.com', since the user is the Assistant Manager of the marketing department. These rules will be executed in the background every single time a user account is being modified. All the user attributes specified in these rules will be updated with the specified values automatically, when the conditions are satisfied. These rules, set by the administrator, will not even be visible to the helpdesk technicians during the modification process. The modification rules offer administrators not just the flexibility and accuracy for modifying user accounts but more importantly, they also help them in protecting the user accounts being modified, from any unwanted or potentially harmful changes. In every organization, every department will have a specific set of roles like manager, assistant manager, etc., each of which will have a specific set of rights and permissions associated with them. For each role, administrators can create templates with the necessary privileges and permissions. When a user's role changes, all that an administrator has do it is just apply the appropriate template to this user account and the user will automatically be assigned the privileges corresponding to the new role which in turn will allow the user to access the resources and information appropriate for that role. These drag-n-drop customizable templates provide administrators the ultimate freedom in specifying what user properties can be modified by which technician. This way, administrators can secure critical user attributes from unwanted changes and still stay in control of the delegated re-provisioning task even after assigning it to a non-administrative user. Display only a specific set of attributes, as per their requirement, during the modification process, by customizing the templates. Make any user attribute visible, editable, read-only or even hide the attributes, if required, during the modification process. As per requirement, place the necessary user attributes in the templates or remove them, by simply 'dragging-n-dropping' them into or out of the templates. Save and reuse the standard or repetitive values that have to be applied for user attributes, instead of updating them manually, every time. This Active Directory management software helps administrators in modifying user accounts, one at a time as well as bulk user modification, with equal ease and simplicity.